Sumeet Mahajan and his laboratory at the University of Southampton has collaborated with researchers from Cambridge University to use gold nanoparticles to identify different types of stem cells in the body. For stem cell therapies to work, clinicians must be able to identify the right stem cells population to repair damaged tissues and organs. This identification process is typically very invasive and often leaves the cells dead or damaged. For example, the use of fluorescent probes to tag and track individual cells is very powerful but quite harmful to cells. Mahajan has been investigating the use of Surface Enhanced Raman Spectroscopy or SERS to examine cells on a molecular level and distinguish adult stem cells from other cells without damaging them. If a metal surface is roughened, and detectable molecules are placed on it, the signal those detectable molecules provide is enhanced by almost a million fold. This enhanced signal allows for the detection of very small quantities, and even though SERS has been used in several different industries, this is the first time it has been used in therapeutics. Mahajan has been thinking about treating bone marrow preparations with gold nanoparticles in order to distinguish the stem cells from all the other cells. Such a technique would allow for the transplantation of only the stem cells and not other material that might not help the patient. Also, scientist studying neurodegenerative diseases such as Parkinson’s disease must transplant dopamine-using neurons. Therefore, identifying specific types of dopaminergic cells is essential for efficacious treatments for Parkinson’s disease. Additionally, researchers are also thinking about using Mahajan’s technique to test the efficacy of particular drugs and diagnose particular diseases. 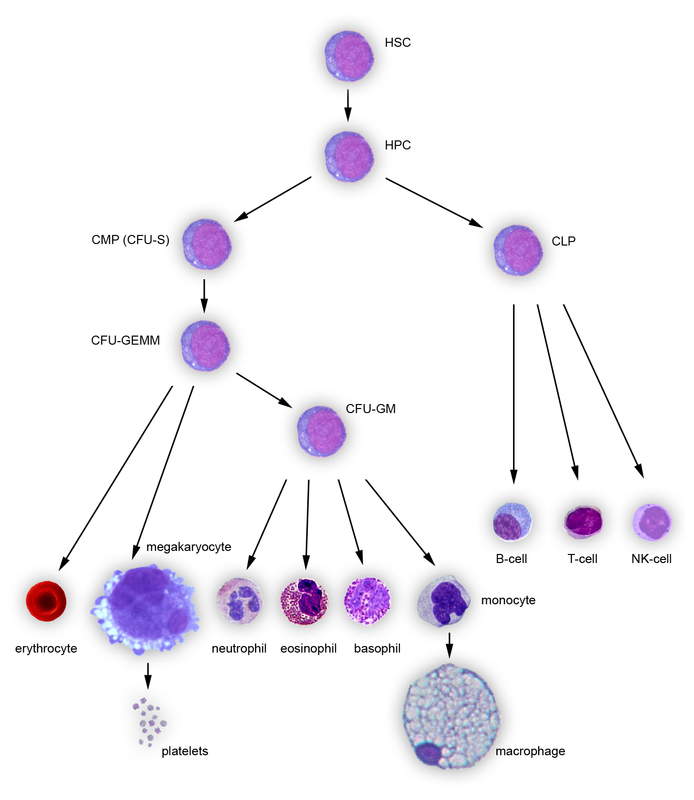 If specific cell types affected by particular diseases (e.g., diabetes, cirrhosis, etc.) could be safely identified and then tested, diagnosis might become much faster. Mahajan is collaborating with major pharmaceutical companies to further develop more effective drugs with his SERS technique. Cancer cells form when healthy cells accumulate mutations that either inactivate tumor suppressor genes or activate proto-oncogenes. Tumor suppressor genes work inside cells to put the brakes on cell proliferation. Proto-oncogenes work to drive cell proliferation. Loss-of-function mutations in tumor suppressor genes remove controls on cell proliferation, which causes cells to divide uncontrollably. Conversely activating mutations in proto-oncogenes removes the controls on the activity of proto-oncogenes, converting them into oncogenes and driving the cell to divide uncontrollably. If a cell accumulates enough of these mutations, they can grow in such an uncontrollable fashion that they start to gain extra chromosomes or pieces of chromosomes, which contributes to the genetic abnormality of the cell. Accumulation of more mutations allows the cell to break free from the original tumorous mass and spread to other tissues. There are over 35 identified tumor suppressor genes and one of these, CHD5, has another role besides controlling cell proliferation. Researchers at Karolinska Institutet in Stockholm, Swede, in collaboration with other laboratories at Trinity College in Dublin and BRIC in Copenhagen has established a vital role for CHD5 in normal nervous development. 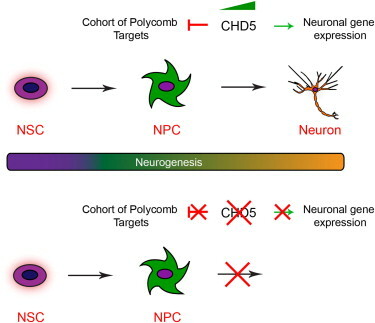 Once stem cells approach the final phase of differentiation into neurons, the CHD5 protein is made at high levels. CHD5 reshapes the chromatin structure into which DNA is packaged in cells, and in doing so, it facilitates or obstructs the expression of other genes. Ulrika Nyman, postdoc researcher in Johan Holmberg’s laboratory, said that when they switched of CHD5 expression in stem cells from mouse embryos at the time when the brain develops, the CHD5-less stem cells were unable to turn off those genes that are usually expressed in other tissues, and equally unable to turn on those genes necessary for making mature neurons. Thus these CHD5-less stem cells were trapped in a nether-state between stem cells and neurons. The gene that encodes the CHD5 protein is found on chromosome 1 (1p36) and it is lost in several different cancers, in particular neuroblastomas, a disease found mainly in children and is thought to arise during the development of the peripheral nervous system. Neuroblastomas that lack this part of chromosome 1 that contains the CHD5 gene are usually more aggressive and more rapidly fatal. Treatment with retinoic acid forces immature nerve cells and some neuroblastomas to mature into specialized nerve cells. However, when workers from Holmberg’s laboratory prevented neuroblastomas from turning up their expression of CHD5, they no longer responded to retinoic acid treatment. Scientists from the United Kingdom have, for the first time, highlighted the natural regenerative abilities of a group of stem cells that live in our hearts. This particular study shows that these cells are responsible for repairing and regenerating muscle tissue that has been damaged by a heart attack. Such damage to the heart can lead to heart failure. There is a robust debate as to the regenerative capacity of cardiac stem cells (CSCs) in the hearts a adult human beings. While many scientists are convinced that CSCs in the hearts of newborns have good regenerative ability, many remain unconvinced that adult CSCs can do similar things (see Zaruba, M.M., et al., Circulation 121, 1992–2000 and Jesty, S.A., et al., Proc. Natl. Acad. Sci. USA 109, 13380–13385). Nevertheless, an earlier paper showed that when introduced into heart muscle after a heart attack, CSCs will regenerate the lost heart muscle and blood vessels lost in the infarct (see Beltrami, A.P., et al., Cell 114, 763–776). Resolving this disagreement requires a different type of experiment. In this paper, Bernardo Nadal-Ginard and colleagues from the and his collaborators at the Stem Cell and Regenerative Biology Unit at the Liverpool John Moores University in Liverpool and his collaborators from Italy used a different way to affect the heart. When heart attacks are experimentally induced in the heart of rodents, the infarcts are large and they kill off large numbers of CSCs. Therefore, Nadal-Ginard and others induced severe diffuse damage of the heart muscle that also spared the CSCs. They gave the mice a large dose of a drug called isoproterenol, which acts as a “sympathomimetic.” This is confusing science talk that simply means that the drug speeds the heart rate to the point where the heart muscle exhausts itself and then starts to die off. This treatment, however, spares the CSCs (see Ellison, G.M., et al., J. Biol. Chem. 282, 11397–11409). When the heart muscle was damaged, the CSCs differentiated into heart muscle cells and other heart-specific cells and repaired the damage in the heart. Also, the repairing cells were in the heart and were not the result of bone marrow stem cells that migrated to the bone marrow, thus putting to rest a controversy that has lasted for some years that CSCs are the result of bone marrow stem cells that migrate to the heart. 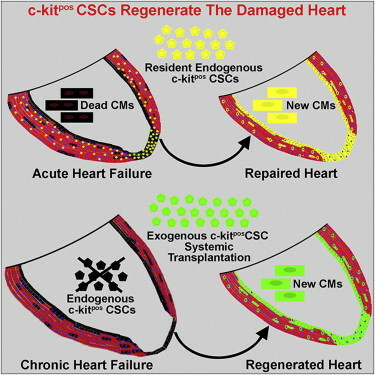 Elimination of CSCs prevents heart repair after heart damage. If, however, these heart-based stem cells are replaced after damage, the heart repairs itself and the heart recovers its function, anatomical integrity, and cellular structure. In other experiments, removal of cardiac stem cells (CSCs) and re-injection after a heart attack shows that the CSCs can home in and repair the damaged heart. Since Nadal-Ginard showed that CSCs have a capacity to home to the damaged heart, less invasive treatments might be possible and that these treatments might even prevent heart failure after a heart attack in the future. These new approaches involved maintaining or increasing the activity of CSCs in order to renew heart muscle and replace old, damaged cells. This new strategy will only require intravenous administration of CSCs and not require open heart procedures that require such a long time to recover. These findings are very promising. The nest step is a clinical trial, which is due to start early 2014 and is aimed at assessing the safety and effectiveness of CSCs for preventing and treating heart failure in humans. The Tirsch Multiple Sclerosis (MS) Research Center of New York has received Investigational New Drug (IND) approval from the Food and Drug Administration to launch a Phase I trial that uses a patient’s own neural stem cells to treat MS.
MS is a chronic disease that results when a patient’s own immune system attacks the myelin insulation that covers many nerves. This damages the myelin sheath and causes degeneration of the nervous system. Some 2.1 million people worldwide are afflicted with MS.
“To my knowledge, this is the first FDA-approved stem cells trial in the United States to investigate direct injection of stem cells into the cerebrospinal fluid of MS patients, and represents an exciting advance in MS research and treatment,” said Saud A. Sadiq, senior research scientist at Tisch and the study’s principal investigator. The groundbreaking study will evaluate the safety of using stem cells harvested from the patient’s own bone marrow. Once harvested, these stem cells will be injected into the cerebrospinal fluid that surrounds the spinal cord in 20 participants who meet the inclusion criteria for this trial. Since this is a phase 1 study, it is an open safety and tolerability study. The Tisch MS Research Center and affiliated International Multiple Sclerosis Management Practice (IMSMP) will host all the activities associated with this study. The clinical application of autologous neural precursors in MS is the culmination of a decade of stem cell research headed by Sadiq and his colleague Violaine Harris, a research scientist at Tisch. Preclinical testing found that the injection of these cells seems to decrease inflammation in the brain and may also promote myelin repair and neuroprotection. In a 2012 publication in the Journal of the Neurological Sciences, Harris and others showed that mesenchymal stem cell-derived neural progenitor cells could promote repair and recovery after intrathecal injection into mice with EAE (experimental autoimmune encephalitis), which is a MS-like disease in mice. They were able to ascertain that intrathecal injection of mesenchymal stem cell-derived neural progenitor cells significantly correlated with reduced immune cell infiltration in the brain, reduced area of demyelination, and increased number of neural progenitor cells in EAE mice. This successful preclinical study was the impetus for this clinical trial. Sadiq said, “This study exemplifies the Tisch MS Research Center’s dedication to translational research and provides a hope that established disability may be reversed in MS.” All study participants will undergo a single bone marrow collection procedure, from which mesenchymal stem cell-derived neural progenitor cells (MSC-NPs) will be isolated. expanded, and tested prior to injection. All patients will receive three rounds of injections at three-month intervals. Safety and efficacy parameters will be evaluated in all trial participants throughout their regular visits with their attending physicians. Professor Kim Jensen from BRIC, University of Copenhagen and Cambridge University has used careful mapping studies to challenge current ideas of how the skin renews itself. Skin is a rather complex organ system that consists of many cell types and structures. Skin includes proliferating cells in the stratum germanitivum, differentiating cells in the upper layers of the epidermis, hair cells, fat, sensory neurons, Langerhans cells, and sweat and sebaceous glands. To give an example of what Jensen is talking about, over-proliferation of skin cells can initiate skin cancer, but the stem cells of the skin that help maintain the integrity of the skin will lack any detectable genetic changes. According to Jensen, the reason these stem cells lack detectable genetic changes in that they do not take part in over-proliferation. To demonstrate this, Jensen used a unique technique to label skin cells. They made a mouse strain that expresses a glowing protein from the control region of the Lrig1 gene. The Lrig1 gene is expressed in all proliferating skin stem cell populations. Therefore, making a mouse strain in which all cells expressing Lrig1 also express a glowing protein is a sure-fire way to label the skin stem cell populations. Jensen and his cohorts used several experimental strategies. First, they simply mapped out the glowing cells in the skin. 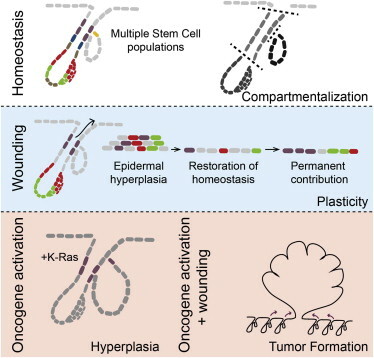 Jensen and his colleagues discovered that the skin contains several stem cell populations that reside in distinct compartments. These different compartmentalized skin stem cells contributed to specific tissues and their domains did not over lap. When the mice were wounded, the proliferating stem cells freely crossed over into each other’s domains and helped heal and remake structures that they normally would not make. This shows that upon wounding, the stem cells compartment boundaries break down as the stem cells proliferate to recreate the compartments that might have been lost as a result of wounding. Therefore, Jensen’s work shows that Lrig1 marks stem cells in the epidermis, and that these stem cells have a unique lineage potential. Secondly, the epidermis is maintained in discrete compartments by these multiple stem cell populations. These stem cell populations largely keep to themselves and do not invade other compartments. Therefore, stem cell compartmentalization underlies maintenance of the tissue complexity of the skin and not “hierarchy.” This simply means that where the stem cells live is far more important to skin stem cell function than who their parents were. Finally, wounding alters stem cell fate and break down the boundaries. Wounding does more than that. When Jensen and his colleagues made a mouse with an activated form of the ras gene that was expressed in skin, the skin showed no signs of tumor formation. This is odd, since activating mutations in ras are extremely common in human and mouse tumors and cultured cells with activated ras mutations grow like cancer cells. However, if the skin of these mice with the activated ras gene in their skin is wounded, then tumors form. Therefore, wounding not only breaks down the compartments in which stem cells reside, it also potentiates cancer formation. British scientists have discovered that aggressive forms of leukemia (blood cancers) do not displace normal stem cells from the bone marrow, but instead, put them to sleep. If the normal stem cells are asleep, it implies that they can be awakened. This offers a new treatment strategy for acute myeloid leukemia or AML. This work comes from researchers at Queen Mary, University of London with the support of Cancer Research UK’s London Research Institute. In the United Kingdom, approximately 2,500 people are diagnosed with AML each year. The disease strikes young and old patients and the majority of patients die from AML. In healthy patients, the bone marrow contains hematopoietic stem cells (HSCs) that divide to form either a common myeloid precursor (CMP) or a common lymphoid precursor (CLP) that differentiate into various kinds of white blood cells or red blood cells or lymphocytes. Individuals afflicted with AML, however, have bone marrow invaded by leukemic myeloid blood cells. Since red blood cells are derived from the myeloid lineage, AML causes red blood cell deficiencies (anemia), and the patient becomes tired, and is at risk for excessive bleeding. AML patients are also more vulnerable to infection those white blood cells that fight infections are not properly formed. David Taussig from the Barts Center Institute at Queen Mary, University of London said that the widely accepted explanation for these symptoms is that the cancerous stem cells displace or destroy the normal HSCs. However, Taussig and his colleagues have found in bone marrow samples from mice and humans with AML contain plenty of normal HSCs. Thus, AML is not destroying or displacing the HSCs. Instead, the cancerous stem cells appear to be turning them off so that they cannot form HSCs. If Taussig and his coworkers and collaborators had determine how these leukemic myeloid blood cells are shutting off the normal HSCs, they might be able to design treatments to turn them back on. Such a treatment strategy would increase the survival of AML patients. Only 40% of younger patients are cured of AML, and the cure rate for older patients in much lower. Current treatments that include chemotherapy and bone marrow transplants are not terribly successful with older patients. Taussig’s group examined the levels of HSCs in the bone marrow of mice that had been transplanted with human leukemic myeloid cells from AML patients. They discovered that the numbers of HSCs stayed the same, but these same HSCs failed to transition through the developmental stages that result in the formation of new blood cells. When Taussig and his group examined bone marrow from 16 human AML patients, they discovered a very similar result. Even though AML treatment has come a long way in the last ten years, there is still an urgent need for more effective treatments to improve long-term survival. This present study greatly advances our understanding of what’s going on in the bone marrow of AML patients. The future challenge is to turn this knowledge into treatments. Under normal circumstances, stress on the body will boost HSC activity. For example, when the patient hemorrhages, the HSCs kick into action to produce more red blood cells that were lost during the bleed. However, the cancer cells in the bone marrow are somehow over-riding this compensatory mechanism and the next phase of this research will determine exactly how they do it. Yuanyuan Zhang, assistant professor of regenerative medicine at Wake Forest Baptist Medical Center’s Institute for Regenerative Medicine, has extended earlier work on stem cells from urine that suggests that these cells might be more therapeutically useful than previously thought. These urinary stem cells can be isolated from a patient’s urine sample, and they can be induced, in the laboratory, to form bladder-type cells; smooth muscle and urothelial (bladder-lining) cells. Such stem cells could certainly be used to treat urinary tract problems, even though a good deal more work is required to confirm that they can do just that. Nevertheless, Zhang and his co-workers have discovered that these urinary tract stem cells are much more plastic than previously thought. In the laboratory, Zhang and others have managed to differentiate urinary tract stem cells into bone, cartilage, fat, skeletal muscle, nerve, and endothelial cells (the cells that line blood vessels). This suggests that urine-derived stem cells could be used in a variety of therapies. Zhang said that urinary tract stem cells could be used to treat urological disorders such a kidney disease, urinary incontinence, and erectile dysfunction. However, Zhang is optimistic that they can also be used to treat a wider variety of treatment options, such as making replacement bladders, urine tubes, and other urologic organs. Since these stem cells come from the patient’s own body, they can have a low chance of being rejected by the immune system. Also, they do not cause tumors when implanted into laboratory animals. In their latest work, Zhang and his colleagues obtained urine samples from 17 healthy individuals whose ages ranged from five to 75 years old. Even though these stem cells are only one of a large collection of cells in urine, isolating urinary stem cells from urine only requires minimal processing. In the laboratory, Zhang and his team differentiated the cells into derivatives of all three embryological layers (endoderm – skin and nervous tissue; mesoderm – bone, muscle, glands, and blood vessels; and endoderm – digestive system). 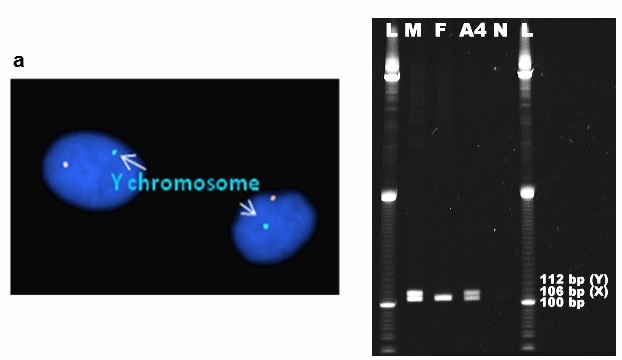 5 ng/ml PDGF-BB) and UCs-lineage differentiation (30 ng/ml EGF) medium was used for 14 days. 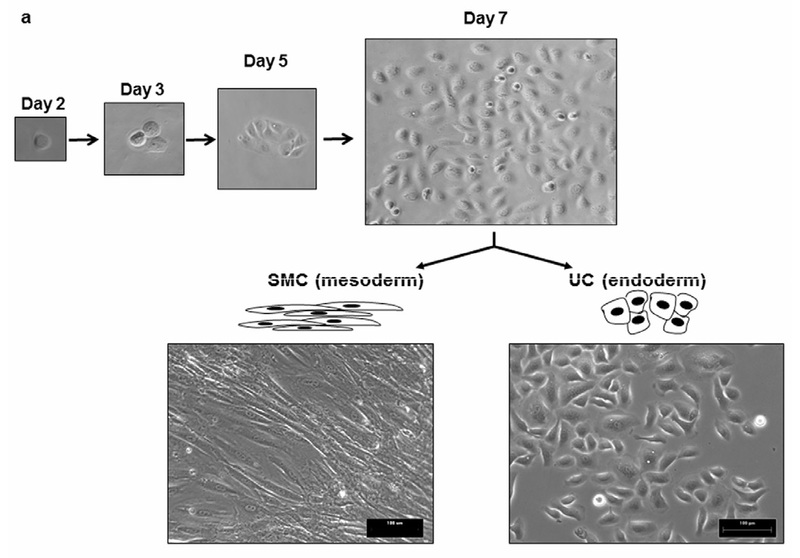 After showing the multipotent nature of urinary tract stem cells in the laboratory, Zhang and others took smooth muscle cells and urothelial cells made from urinary tract stem cells and transplanted them into mice with tissue scaffolds that had been made from decellularized pig intestine. The scaffolds only had extracellular molecules and not cells. After one month, the implanted cells had formed multi-layered, tissue-like structures. revealing the isosurface (left) and density heat maps (right). Urinary tract stem cells or as Zhang calls them, urine-derived stem cells or USCs, have many cell surface characteristics of mesenchymal stem cells from bone marrow, but they are also like pericytes, which are cells on the outside of small blood vessels. Zhang and others suspect that USCs come from the upper urinary tract, including the kidney. Patients who have had kidney transplants from male donors have USCs with a Y chromosome in them, which suggests that the kidney is a source or one of the sources of these cells. male donor-to-female recipient urine sample, N: negative control). Even more work needs to be done before we can truly become over-the-moon excited about these cells as a source of material for regenerative medicine, Zhang’s work is certainly an encouraging start. See Shantaram Bharadwaj, et al., Multi-Potential Differentiation of Human Urine-Derived Stem Cells: Potential for Therapeutic Applications in Urology. Stem Cells 2013 DOI: 10.1002/stem.1424.